What Causes Edema Above the Eyes? Edema, also known as swelling, can appear near the eyes. In some cases, the swelling may affect the upper and lower eyelids or only one eyelid. In some cases, only the area just above the eye may appear swollen. The variety of locations edema may occur does not typically change what may have caused the swelling in the first place. 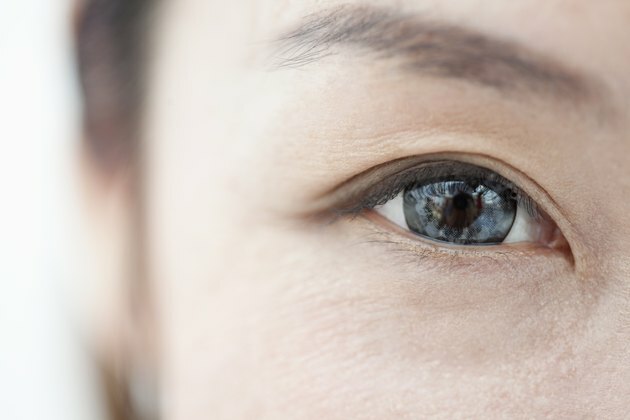 Knowing the causes for the edema around the eye may help prevent the condition and also determine if a person needs immediate medical attention. Allergies often affect the eye, causing not only redness, itching and watering, but also swelling around the eyes, says The University of Michigan Kellogg Eye Center. The reaction occurs when the immune system over-reacts to the presence of allergies. People may react to many different things in the air, such as pollen, pet dander or perfume. Edema will often decrease with the use of oral antihistamines or other allergy medications. For some people, however, they may need an allergy eye drop to reduce swelling and any other eye symptoms. Most pharmacies sell oral allergy medication and allergy eye drops that do not require a prescription. If these medications do not relieve symptoms, the person should contact an eye doctor to determine further treatment, which may include prescription allergy tablets or eye drops. An eye infection caused by bacteria or a virus may also cause swelling, says the American Optometric Association. These infections, called conjunctivitis, or more commonly "pink eye," may have additional symptoms. These may include severe redness, irritation, discharge and light sensitivity. Many people do not require medications to resolve the infection, and the swelling will go down as the condition improves. However, some people with a bacterial infection may need antibiotic eye drops, particularly with severe infections that include significant swelling. Eye drops will not cure a viral infection in the eyes, but if symptoms persist or worsen, a doctor may prescribe a steroid eye drop to decrease swelling and other symptoms. A serious condition called orbital cellulitis may also cause severe edema and other complications. This occurs when an infections infiltrates the tissues around the eye, including the tissue and muscles behind the eye itself, says MedlinePlus. The eyelids will often have discoloration, turning a red or purple color. The area may also have a shiny appearance as the edema causes the skin to tighten. Other symptoms include high fever and pain. A person with the condition may have a hard time moving her eyes without pain, and her eyes may appear to pop out. Orbital cellulitis requires immediate medical care since it can lead to serious, vision-threatening or even life-threatening complications. Treatment will usually include multiple doses of antibiotics given through an IV, which typically requires a hospital stay.